Ford shut down production of the F-150, its best selling vehicle, on May 2 after a magnesium fire at a supplier caused a parts shortage. But just two weeks later it’s going back online after the automaker moved 87,000 pounds of equipment to England, hiring one of the world’s biggest cargo planes to do it. Following a fire at Meridian Magnesium Products of America in Eaton Rapids, which disrupted die-cast automotive parts supplies for Fiat Chrysler, General Motors, Mercedes and Ford, it’s biggest client, Ford opted to move 19 die tools from Meridian to quickly resume its pickup truck production, according to the Detroit Free Press. 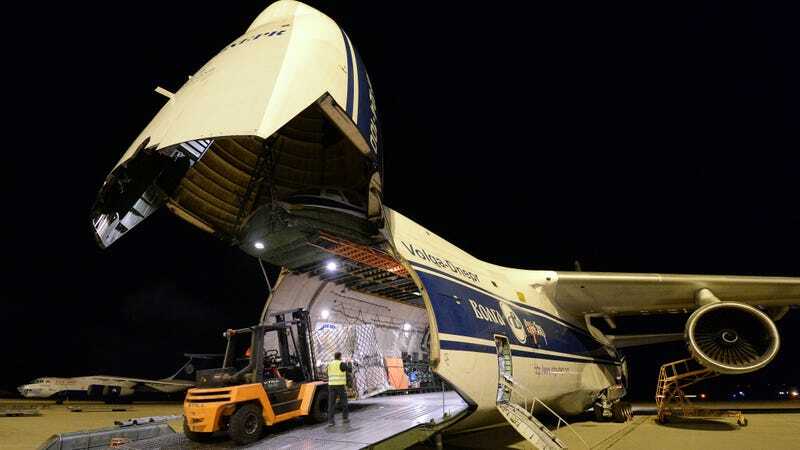 In one case, Ford moved an 87,000-pound tool from Eaton Rapids to Nottingham, England, using an Antonov An-124 Russian plane in 30 hours door to door. The Antonov is one of the largest cargo planes in the world that’s used to carry transport such items as trains and yachts more than 82 feet long. Parts produced at Nottingham are being shipped daily on a Boeing 747 jet until production in Eaton Rapids returns to normal, Ford said. Ford’s F Series is crucial to the company’s finances, particularly as it moves away from sedan production. In 2017, Ford built 1,052,658 F-Series trucks, which averages 3,000 to 4,000 a day when accounting for periodic plant shutdowns. The vehicles sold for an average of $46,500. The F-Series truck generated more than $40 billion in revenue for Ford. The Ukrainian Antonov An-124 was designed back in the 1980s for massive cargo shipments, with modern updated models having a maximum cargo capacity of 150 metric tonnes (or 165.35 U.S. tons). It’s often leased by governments, militaries and major companies for transport of heavy equipment and massive vehicles. Of course, if you have something even bigger you need carried through the air than an An-124 can deliver, you can always step up to its bigger sibling, the Antonov An-225. Originally developed to transport the Soviet Buran space shuttle, the An-225 holds the world record for heaviest commercial payload at 545,000 pounds. That’s a lot. In Eaton Rapids, 250 workers were put out of work by the Meridian fire, and according to the report, 7,600 Ford employees had to wait for the automaker to reorganize production of the die-cast parts before being able to return to work tomorrow. UAW workers at Ford’s Livonia Transmission Plant faced reduced shifts, which ends Monday. Production of GM’s full-size vans in Wentzville, Missouri was halted a week ago and has not yet restarted, but workers were reassigned to other vehicles, according to the Detroit Free Press. FCA was able to “balance production” at its Windsor Assembly Plant to avoid disrupting production, and Mercedes SUV production has been shut down indefinitely due to the fire with a reduction in worker shifts at its Vance, Alabama facility, according to the report.